This story was updated at 4:35 a.m. EDT. CAPE CANAVERAL, Fla. - The space shuttle Endeavour's launchplans were thwarted again early Wednesday when a hydrogen gas leak, the sameglitch that stopped the spacecraft from lifting off last week, appeared for asecond time. The potentially dangerous hydrogen gas leak from a vent pipeon Endeavour's external fuel tank forced NASA to stop fueling the shuttle inpreparation for its plannedlaunch at 5:40 a.m. EDT (0940 GMT) Wednesday. "We did our standard troubleshooting techniques,"NASA launch director Mike Leinbach said. Unfortunately, "it never cleanedup." Endeavour will now have to wait until July before again tryingto blast off from Launch Pad 39A here at NASA's Kennedy Space Center on anambitious construction flight to the International Space Station. "I'm sure you all know thatwe postponed again," Endeavour commander Mark Polansky wrote via Twitter. "It'sa reminder that spaceflight is NOT routine. We will fly home to Houston thismorning." NASA officially called off today's launch attempt at 1:55a.m. EDT (0555 GMT). The agency was already scrambling to make up for hours oflost time due to stormy weather that delayed the fueling of Endeavour'sexternal tank. The shuttle's seven-astronautcrew had not yet boarded the spacecraft when NASA called off the launchattempt. "The team did an outstanding job over these last four days to get to thispoint," Leinbach said. "It was just a heck of a lot of work that theguys pulled off. I sure wish we could have rewarded them and the astronautswith a launch." Mission managers had worked furiously earlier this week toswap out the leaky seal between the hydrogen gas vent pipe on Endeavour'sexternal tank in the hopes that it would fix the glitch, which prevented a June13 launch attempt. The repairs went smoothly, but the persistent leak appearedagain today shortly after ground crews began fueling the shuttle's giant orangeexternal tank. This problem has cropped up before: An almost identical leakhalted the launch plans of the space shuttle Discovery's STS-119 mission inMarch. In that case, the seal swap-out worked, and Discovery was able to launchfour days later than planned. Now mission managers will have to probe more deeply into theroot cause of this failure to try to prevent it in the future. "This business that we're in is not for the faint ofheart," NASA deputy shuttle program manager LeRoy Cain said at apost-delay briefing. "There are times when we don?t get to go fly andthat?s fundamentally because it's not easy. Like problems we've had in thepast, we'll get past this one as well and move forward." The glitch appeared after an earlier weather hurdle hadfinally been cleared. Endeavour's towering orange fuel tank was set to beginfilling late Tuesday at 8:15 p.m. EDT (0015 GMT), but NASA had to delay almostthree hours because of thunderstorms and lightning near the launch pad thatpose a risk of igniting the vehicle's highly flammable liquid hydrogen andliquid oxygen propellants. 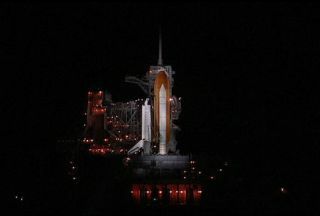 The weather cleared just in time for the latest possiblestart, and fueling began shortly after 11:00 p.m. EDT (0200 GMT). NASA teamsappeared to be on track to launch as scheduled despite the lost time until thegas leak resurfaced. Endeavour will stand down until July 11 to allow a pair of unmannedlunar probes to launch from the nearby Cape Canaveral Air Force Station.That launch, which had also been scheduled for Wednesday, was pushed back togive Endeavour a second liftoff opportunity. Now the moon mission will likelytry to blast off on Thursday or Friday. While NASA does expect the delay to cause a ripple downthrough future flights planned for later this year, the delays should notimpact plans to retire the shuttle fleet in 2010 after eight more missions,Cain said. Endeavour's mission is NASA's third of upto five shuttle flights planned for this year. Endeavour is slated for a busy 16-day mission to theInternational Space Station to deliver an outdoor research platform for the JapaneseKibo laboratory. Commander Mark Polansky will lead a seven-member crewthrough five challenging spacewalks and complicated robotic work to install thenew lab piece, plus a load of spare supplies for the station. The shuttle will also carry a new long-duration crewmemberfor the space station, NASA astronaut Tim Kopra, who is due to replace currentstation resident Koichi Wakata of Japan as an Expedition 20 flight engineer.